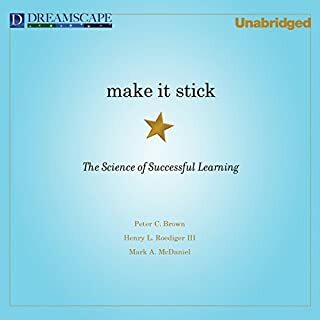 “Make it Stick” should be required reading for all students. In fact, I’m considering making it just that for the introductory psychology students I teach. The authors do an excellent job of conveying the best current research on learning, showing systematically how the research can inform best practices for students. Common study strategies such a re-reading and cramming (“massed practice”) are shown to be ineffective, and the authors do an excellent job of marshaling the data to show just how ineffective these practice are. Instead, the authors suggest retrieval practice, interleaving, spaced practice, and other techniques proven to boost retention and comprehension. The authors explain (using the very techniques they advocate) how each technique has been shown by the research to boost learning among students. They back the data up with specific anecdotes that illustrate the concept in question. The authors do an excellent job of combing data and stories, establishing a firm scientific grounding with the number, and then bringing those numbers to life with engaging tales of real life learners. The examples of a surgeon employing reflecting to improve his technique or of pilots using simulation and retrieval practice to prepare for in-flight emergencies really help make the techniques stick. Anyone interested in learning – whether you’re still getting grades or not – should really read this book. White Trash claims it will tell “The 400-year untold history of class in America”. Instead, the book relays the 400-year history the ways in which poor-whites have been derogated in America, but largely omits the origin of the white lower class. The history begins with the arrival of criminals, beggars, and other “waste people” (as they were called at the time) from England. We are quickly given the litany of slurs and admonitions hurled against this lower class, but nowhere are we told how they came to be. They simply “are”, and this theme persists throughout the book. In era after era, “white trash” simply exist. “White trash” are presented as a poor, malnourished, uneducated group viewed by the rest of society as lazy, aggressive, incestuous, and ignorant, and Dr. Isenberg really never provides any alternative explanation for their state. There is little time spent on discussing social conditions that might have led to the existence of the “waste people” in the first place, nor of how external factors might have perpetuated their poor state. 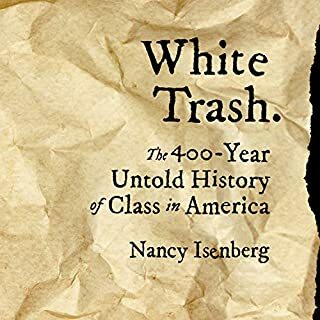 Dr. Isenberg focusing more on describing the insults hurled against the white poor by the more fortunate, and occasionally on questioning the egalitarian bonafides of the founders (certainly a worthy endeavor, but not particularly useful to advancing the aim of the book), but spends little time explaining where white trash came from and why they still exist. Dr. Isenberg spends ample time discussing eugenics, but seems unable or unwilling to distinguish the theory of eugenics in particular from the broader concepts of evolution and heredity. She write as though she rejects the very notion of heredity, railing at one point against those who claim intelligence is heritable. Data show fairly unambiguously, however, that traits such an intelligence and self-control are heritable, at least in part. Rather than a nuanced discussion of the interplay between genes and environment, Dr. Isenberg sets up a false dichotomy between nature and nurture, falsely equates nature with eugenics, and then spends the better part of the book attacking her strawmen. What makes this particularly frustrating is that she spends almost no time suggesting alternative explanations for the state of poor whites. If genetics are not to blame, than what is? To be clear, I believe there a numerous environmental factors in the history of United States which could be cited as reasons for persistent white poverty, but Dr. Isenberg largely ignores them, choosing instead to rail against eugenics. When the 20th century arrive, Dr. Isenberg adds the boogey-man of capitalism to the list of targets, but does little to explain how the free market system contributed to the plight of the white poor in America. If you’re looking to better understand where the lower class in America came from, look elsewhere. If you could sum up Whistling Vivaldi in three words, what would they be? What other book might you compare Whistling Vivaldi to and why? 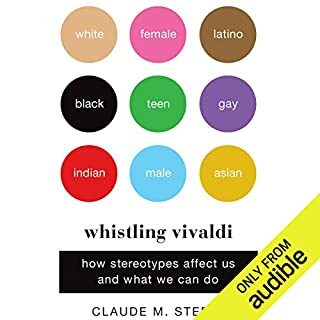 Whistling Vivaldi is similar to other excellent psychology books written for the lay audience, such as Dan Gilbert's Stumbling on Happiness or Roy Baumeister's Willpower, in that it conveys a complex and important program of research in way that is engaging and accessible to a lay audience. What does DeMario Clarke bring to the story that you wouldn’t experience if you just read the book? The reader does an excellent job, but in general I don't find that a reader can transform the experience of nonfiction in the same way as fiction. Everyone's behavior is affected by stereotypes, both by those we ourselves hold about others and by the fear that others will see us through the lense of their own stereotypes. Claude Steele's research on stereotype threat is groundbreaking, and I truly believe it's something everyone should be aware of. This book does an excellent job of explaining this body of work in a way that provides the reader with actionable information about their behavior. I was drawn I. to this course from the very first lecture. Professor Cahoone is an excellent lecturer. There are moments where he misspeaks and then corrects himself, but I felt this added a sense of realism and humanity to the lectures. He does an excellent job of distilling complex ideas I to easily digestible nuggets. I think anyone with an interest in politics would benefit greatly from. this course. What did you like best about Atlas Shrugged? What did you like least? The first two-thirds of the book are quite good. Rand creates a very romantic, black-hat vs. white-hat world, so her characters shine the most when they are set in stark opposition to her villains. The world itself is most intriguing as it slowly slides toward chaos. What I liked most about the book, overall, was that it provides a somewhat unique perspective on dystopia. Most dystopias (e.g 1984, Brave New World) drop the reader into the midst of a dystopic future. Atlas Shrugged begins the reader in a functional world, and charts the declines of that world into disarray. Where the book begins to fall apart is in the final part, part 3. A major mystery having been resolved, the story loses a significant amount of its momentum. It is no longer clear what, exactly, the reader is waiting for. 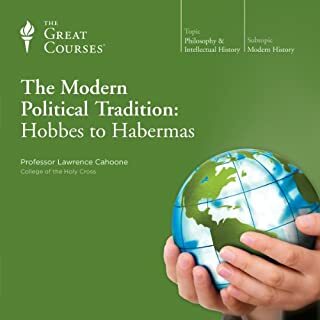 This directionless course ultimately culminates in a rather unfulfilling end, which left me wishing the book had ended fully 1/3 earlier than it did. Would you be willing to try another book from Ayn Rand? Why or why not? Probably not. It's not that I disliked the book, I simply wouldn't be ready to commit to another novel of biblical proportions from Rand. I feel I received a sufficient education in Randian philosophy from Atlas Shrugged as to negate the need for a reading of The Fountainhead. My favorite scene was Hank Reardon's trial. This displays Rand at her best - writing an impassioned, self-righteous, romantic monologue praising the ethics of work and creation while denouncing the ills of compulsion and envy. 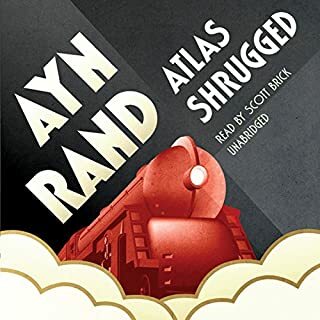 A word of warning the potential listener - if spending hours listening to passionate defenses of capitalism and denunciations of government sounds like hell on Earth, you would be advised to steer clear of Atlas Shrugged. Partially. This is a long book, but I still managed to devour the first two thirds in record time. That said, I found the final third of a the book to be a chore. I lost interest in most of the characters I had previously been invested in, and I had not sense of urgency regarding any aspect of the larger narrative. Ultimately, the book delivers some 20 hours of captivating reading followed by 10 hours which, frankly, should have been cut from the book at the editing phase. If you are curious about libertarianism or free market philosophy, please don't make Atlas Shrugged your first exposure to the concept. Rand is rather extreme in many ways, and her philosophy of Objectivism is not synonymous with either free market capitalism or libertarianism. You might instead read the works of Murray Rothbard (For a New Liberty) or David Boaz (Libertarianism: A Primer) for accessible and comprehensive reviews of these worldviews. If, on the other hand, you are already versed in free markets and libertarianism, you might consider reading the book as either A) a champagne bath (several speeches will have you pumping your fist and shouting "Yeah! Nobody understands me!") or B) to gain a better understanding of Rand's peculiar brand of capitalism and ethics. If you are already convinced of the liberal position, I suppose this book would serve as a good champagne bath. If, however, you'd like a more substantive presentation of the position, I recommend The Law of Peoples by John Rawls. Has The Conscience of a Liberal turned you off from other books in this genre? 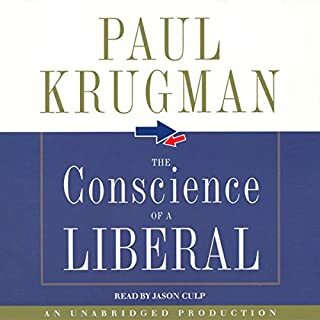 This book has turned me off to other books by Dr. Krugman. I hoped a scholar of his renown would be able to deliver a deep defense of the positions he holds. Instead, I found a purely emotive presentation of his worldview. I was very disappointed, and will look elsewhere in the future when consuming material on liberal political ideology. 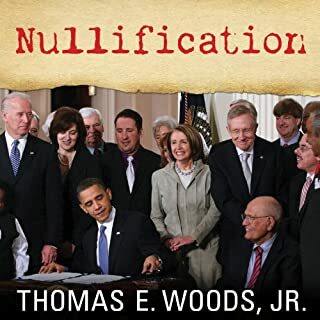 I went in to this book as a Libertarian hoping to gain perspective on the underlying logic of the liberal worldview. Instead, Dr. Krugman delivers a shallow diatribe against the wealthy and in favor of redistribution of wealth without ever addressing the philosophical underpinnings of the position. Beginning from the apparently axiomatic point that the wealthy owe a debt to the poor, Dr. Krugman spends his book outlining the various ways in which societal problems could be addressed if only we would tax the wealthy or regulate Wall Street. Absent is any defense of why it is justified to do these things. I really wanted to like this book; sadly, I did not. Lest you think I merely hated the book because I disagreed with the premise, I would suggest that the work of John Rawls provides a much more satisfying read. I still do not agree with his premises, but I greatly enjoyed his precise logic and feel that I better understand the liberal position after reading his work.